KUNAR PROVINCE, Afghanistan —A former insurgent commander swore allegiance to the Islamic Republic of Afghanistan April 14 in Asadabad, agreeing to turn in his weapons and cease hostilities against Afghan and Coalition forces. As Coalition forces have been hunting near the Afghan-Pakistani border for insurgent leaders, Najmuddin turned himself in to India Company, 3rd Battalion, 3rd Marines, abandoning his run as one of the more elusive insurgent leaders. They were informed by a message received the morning of April 10 explaining where the commander was located and his intent. The India Company leadership quickly moved to the designated location and, crossing over a bridge into the compound, finally came face-to-face with the man they were able to recognize only from an outdated photograph. He has been allowed to participate in the Allegiance Program, a program currently offered to Taliban and HIG (Hezb-E Islami Gulbuddin) fighters who wish to stop fighting and start participating in the rebuilding of Afghanistan. A ceremony which was attended by nearly 300 civic and religious leaders from across the Kunar province was the first step in the process of repatriation for Najmuddin who explained his reasons for turning himself over to the Marines through an interpreter. His participation in the Allegiance Program comes on the heels of extensive duration operations around the areas Najmuddin was known to frequent in the Pech Valley. Aggressively approaching the detention of insurgent leadership in the area afforded Marines the success that had eluded other units. The Marines of India Company, once tasked with eliminating the threat Najmuddin posed to stability in the area, applied constant pressure to him for two and a half months. While he said the constant presence of well-trained Marines was the ultimate reason he turned himself in, it was also the humanitarian outreach and rehabilitation projects in his area that Marines participated in that convinced the former insurgent leader to come forth. Bellman, who spoke with Najmuddin, said he expressed happiness with many of the good things he saw the Marines doing in the Pech Valley and that he knew his area was improving because of the Afghan and Coalition forces. Najmuddin was greeted warmly by everyone in attendance at the shura (a meeting of Afghan elders, religious leaders and government officials) which coincided with the ceremony. Both he and the community leaders present expressed a sincere desire for peace. After giving a short speech, he was sworn to uphold his end of the agreement by the governor of Kunar. Capt. Jim Sweeney, India Co. Commander was present for the ceremony and signed the official document as a witness. The governor of Kunar, Asadollah Wafa, said the Islamic Republic of Afghanistan hopes the program will put an end to local insurgencies and further drive a wedge between Afghans and the foreign-national terrorists who have been operating in Afghanistan. By accepting former insurgent “middlemen” like Najmuddin, he hopes that the money and support that keeps the insurgency alive in eastern Afghanistan will dry up. The Allegiance Program is an effort to bring many formerly prominent Afghans back into the fold of the new government, he said. As long as an individual has committed no crimes against humanity, he may get a second chance at citizenship. “Everyone is happy that he finally turned himself in. The community supports his decision to do so, and I think that will make a big difference in how some other Taliban fighters react to us,” said Sweeney. Sweeney also expressed hope that Najmuddin is only the first in a line of insurgents who will decide to lay down their arms and cooperate with the Afghan government. To facilitate that, America’s Battalion will continue its aggressive operations throughout Afghanistan’s eastern region. Peals of laughter rang through the remote Afghan farmhouse as neighbours rushed to welcome home the long-lost son of the soil. Hugs and handshakes were exchanged. Teenage boys offered trays of sweet tea. The women waited patiently in a back room, silent and unseen as ever.The bearded man at the centre of the hubbub, Mufti Habib-ur-Rehman, allowed his solemn face to crack into a grin. “It’s good to be back,” he said. Last month, after secret negotiations brokered by local mullahs – and promises from the Americans not to shoot – he came in from the cold. “I am not a terrorist. I am here to work for the reconstruction of my country,” he said before pledging allegiance to the president, Hamid Karzai. Reconciliation efforts in at least four southern provinces – led by governors, mullahs and tribal leaders – have netted a small but influential group. They include a handful of commanders and the former governor of Helmand province. On Tuesday the former Taliban foreign minister, Mullah Wakil Ahmad Mutawakil, said he would contest a seat from Kandahar in next September’s parliamentary elections. It may not be so simple. Last week Mullah Muhammad Omar, the Taliban leader, scotched hopes of an early truce by rejecting an amnesty offer from the Afghan government’s lead negotiator, former president Sibghatullah Mojaddedi. 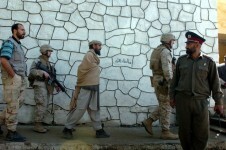 Afghan officials insist a peaceful solution is within reach. Three programmes in Khost – a town once home to Osama bin Laden – claim to have attracted between 10 and 20 militants each. Syed Muhammad, a returned Talib, said that in Miriam Shah, North Waziristan’s main town, Taliban fighters cruised the streets and local mullahs preached jihad.”They say that Islam is in danger from America. It is destroying Afghanistan first, and then it will come to Miriam Shah,” he said during an interview in the governor’s garden. Pakistani’s Inter-Services Intelligence agency (ISI) plays a hotly disputed role. Three former Taliban said that the spy agency, which fostered the Taliban in the 1990s, was funding and training its militants. “It is an open secret,” said one, who requested anonymity. Whatever their support base – Arab donors are also suspected of contributing money and arms – many Taliban are getting sick of fighting, said Mullah Rahmatullah Mansoor, a militant cleric who returned home last year, and later secretly met Mr Karzai. One issue hindering reconciliation was the continued detention of Afghans at Guantánamo Bay, he added, an issue that sparked nationwide riots last week after Newsweek alleged that a Qur’an had been flushed down a toilet. About 17 people were killed and 100 injured. Najmuddin Being Driven to the Asadabad Police Station for his reconciliation ceremony.